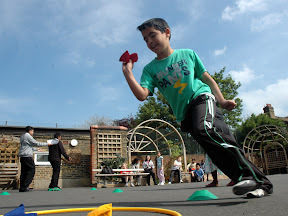 The 12th and 13th of May saw succesfull Multi-Skills Festivals held at Downhills and Seven Sisters Primary Schools in total close to 400 children took part in the multi skills virtual league. Park View Academy students assisted in the leading of the activities over the two days, enhancing their leadership skills. The virtual League allows pupils from different schools across Haringey to compete with one another without leaving the confines of their own school. The competition runs throughout the academic year and hopes to teach the basics of Agility, Balance and Coordination through 6 different fun based activities.